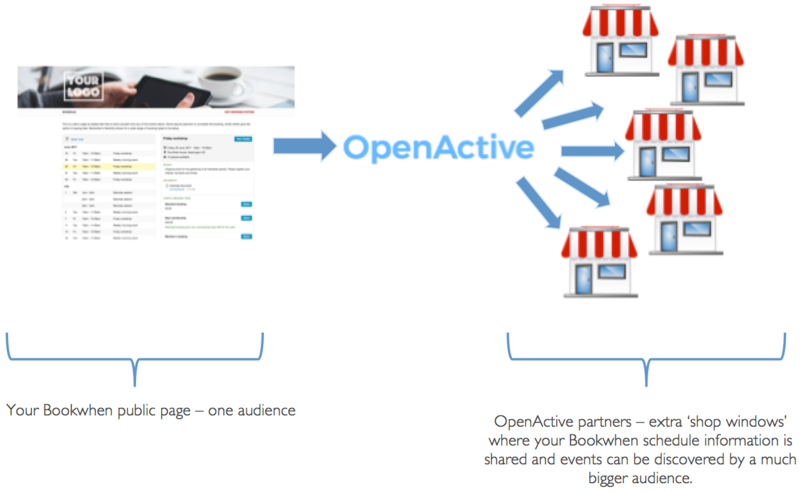 Bookwhen has recently partnered with OpenActive to make your scheduled events available to a much bigger audience. It's designed for anyone organising fitness and wellbeing activities in the UK. OpenActive collects data about fitness activities from across lots of sources - Bookwhen being one of them. This information is then 'consumed' by OpenActive partners to display to their audiences (diagram below). Partners range from local authorities, to large national class finder sites. It's these partners that offer the chance for your classes to be discovered by a much bigger audience and market. It's completely free and you can opt-out at any time. Make physical activity sessions and facilities easier to find: get more people through the door! PS - the last two points are optional...! How do I include my data?